Broom 35 Sedan motorcruiser with extended Flybridge. The boat offers six berths in 3 cabins with 6′ headroom throughout. The comfortable, sociable interior has a light and airy feel to it. Twin Perkins diesel engines each with 145hp give her great manoeuvrability with a maximum speed of circa 20 knots. The Sedan is equally happy at sea or on the inland waterways. It was built in 1978, hull constructed of GRP, one of only 70 produced by Broom Boats Ltd of Norfolk. The boat has proved to have good sea keeping qualities worthy of the Broom name. The vessel has generally cruised the length of the Thames and also around the south of England. Its overall length is 35 ft with a beam of 12 ft and a draught of 3 ft. 2 x 90 gallon diesel fuel tanks and 1 x 80 gallon water tank. Accommodation heated by Webasto diesel fired 24v central heating. Forward cabin: twin V berth with drawers beneath the berths, wardrobe. Access to chain locker and opening Houdini window hatch. Side cabin: double berth with drawers beneath, locker below bed, 240v radiator rail, Houdin window hatch. Galley: single bowl with mixer tap, cupboard and drawer, additional pull out worksurface. Space for storage for crockery and cutlery etc. Floor laid with stripped beech effect and two hatches to bilges to access shower drain box, seacocks and bilge pumps. Heads: shower with mixer, sink, mirror and shelf for toiletries. Hot water via calorifier which is heated by the starboard engine or 240v immersion heater. Saloon: cabin sides lined and trimmed with various drawers and cupboards for storage. Access to the bilges and engines in the saloon area. Saloon also has the lower helm position with full instrumentation. This area leads on to the aft teak deck cockpit area via sliding patio doors. Helm: Morse MT3 controls, compass, trim tabs, speed log, depth sounder, rudder indicator guage, bilge pump auto/manual/alarm switches, guages, wiper motor switches. Aft cockpit area: large teak deck with plenty of room for table and chairs to enable al fresco eating, ceiling downlight from under flybridge, transom hatch door leading to aft bathing deck/swimming platform. 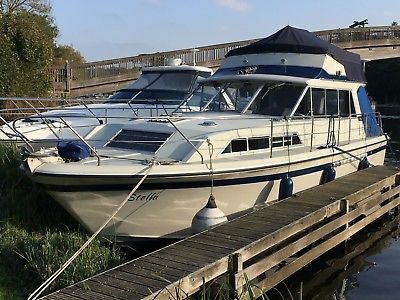 Access via a large lazerette lifting on gas struts for storage and access to where you will find batteries, stern gear, large manual bilge pump and water tank. Canvass cover with zip door over aft cockpit area. Vetus davits. Ladder leading up to flybridge. Flybridge: secondary helm position, large teak deck area, canvas cover. Engines: access through hatches in main saloon, two Perkins T6354 turbo diesel engines, six cylinder, 145hp each. Borg Warner gearboxes 1:6 ratio, hydraulic steering gear, 3 blade propellors and trim tabs. The canvas covers are in good condition. Guard rails and Stainless Steel fittings outside are all in good working order and condition. The boat is well constructed by the reputable manufacturer Broom Boats Ltd. More photos available at the Apollo Duck website. Extensively overhauled since April 2017 which includes but not limited to the following: Cutlass bearings renewed. Propellors serviced and overhauled by Clements Engineering. Port Borg Warner gearbox removed, overhauled and serviced by Lancing Marine. Stuffing glands renewed. Engines serviced, oil filters and oil change. Turbo covers renewed and exhausts lagged. New MG Duff magnesium anodes and bolt posts with new backing boards. Bonding cables checked and renewed and tested as requred. Seacocks renewed with new backing boards. Bathing deck refinished and sealed. New cabling and circuits for Navigation lights, flybridge controls, horn, worklights, interior lights, bilge blower, downlights, anchor light, underwater led stern lights. New starter batteries and domestic batteries. New NASA clipper depth sounder and speed log. new rudder indicator guage. New Houdini hatch front v berth. New cabling, circuits and consumer unit for 240v hook up. Canvas covers repaired and refitted. Dodger canvas repaired and refitted with new footman loops and ties. Window seals renewed as required and tested for leaks. Flybridge deck repaired, sanded, cleaned and sealed. New led lighting by way of downlights, striplights and wall lights throughout. Battery master switches renewed for domestic and engine starter batteries. Sterling pro 24v mains smart charger fitted. Bilges cleaned and painted. Rule shower box sump fitted with 1 1/2″ waste outlet for shower. 4 new Rule bilge pumps fore and aft with automatic float switches. New chrome finished skin fittings. Hull compound polished, waxed and high gloss laquer. All new light fittings are led.New ropes and side fenders.new twin horns.USB sockets with auto sense for android/iphone etc.Replace output shaft oil seal on Starboard gearbox.New transom stern lights.Renew 2 x Fire extinguishers.Renew engine alternator belts.Replace water hoses.Houdini hatch side berth renew seal and tested for leaks.Renew Raw water intake impellers.Boat safety certificate until June 2021Environment Agency Thames River License until Dec. 2017.Boat name being Retained.Viewing by appointment onlyBoat is lying on the Thames, please ring 0776 776 3456 to arrange a viewing or for any other information.